In Stock, ready to ship within 1-3 Business days. Light weight, performs amazingly well on stage and runway. From Central Florida to Southeast Asia and back again, Anabella Cecilia has travelled the world in search of inspiration while enjoying the best the world has to offer in cuisine and culture. An emerging teen fashion designer, her dream of showing at New York Fashion Week came true in September 2018, as she showed her most recent collection at the NYFW2.0 show hosted by Beauty It’s Everywhere. Anabella started her journey to Fashion Week as a child competitor in pageants and was crowned the first ever Preteen Earth United States in 2016 at 12 years old. She had the opportunity to showcase her “Glamorously Green” runway wear which was upcycled from a formal gown belonging to her mom and turned into a fun fashion for the “Runway for Orlando” fashion show to benefit the victims of the Pulse Orlando massacre. Her year of service was punctuated by volunteer service with the Orange County Environmental Protection Division, Clean The World, and Feeding Children Everywhere as well as appearances at charity events and showing her collection of eco-friendly clothing using repurposed leather and upcycled clothing at charity fashion shows benefitting St. Jude's Children's Cancer Research Hospitals and Children's Miracle Network Hospitals. In 2017, Anabella was able to compete for the titles of National American Miss Florida Preteen where she finished in the top 10 in a field of over 150 competitors; World’s Perfect Junior Teen where she finished in the top 15 and at Miss Teen World America as the youngest teen at barely 13 years old thanks to a February birthday and each pageant having different criteria for each age division. As far as she knows, she’s the only contestant to manage all three within the space of three weeks! During Thanksgiving week 2017, she was crowned the national Miss American Victory Preteen for 2017-2018 and has continued her volunteer work with a local elementary school as well as Feeding Children Everywhere and Ronald McDonald House and showing her designs at multiple fashion shows. In December, she travelled to New Orleans, Louisiana to show her designs at the Magnifique Fashion Show/Model Showcase where she was granted a management contract through Westhaven Management and was honored to be commissioned to create a design for America’s Next Top Model finalist Victoria Henley to wear on national television and at Fashion Week. Spring 2018 saw Anabella honored with the closing collection of the kids’ show at Orlando International Fashion Week. She was able to showcase her signature piece “49 Windows” as the final garment to walk the runway. This piece was designed to memorialize the 49 victims of the Pulse shooting and is created from all natural fibers including wool, silk, and repurposed leather. Shortly after Orlando International Fashion Week, she was honored to be chosen as the Sunshine Foundation Ambassador. Representing The Sunshine Foundation, the country’s oldest wish granting charity, she helps raise awareness and funds to grant dreams to children who are chronically ill and/or abused. In June of 2018, she showed her most current collection at Model 4 Miracles while raising funds to benefit Children’s Miracle Network Hospitals and was crowned Miss Miracle Junior Teen 2018. Part of her year of service includes ongoing fundraising for CMNH and delivering toys for children who will be hospitalized at the holidays. Over the summer, she also had the opportunity to work as a model/brand ambassador for NAOMI Polish and was featured in marketing materials seen at Fashion Week and more. 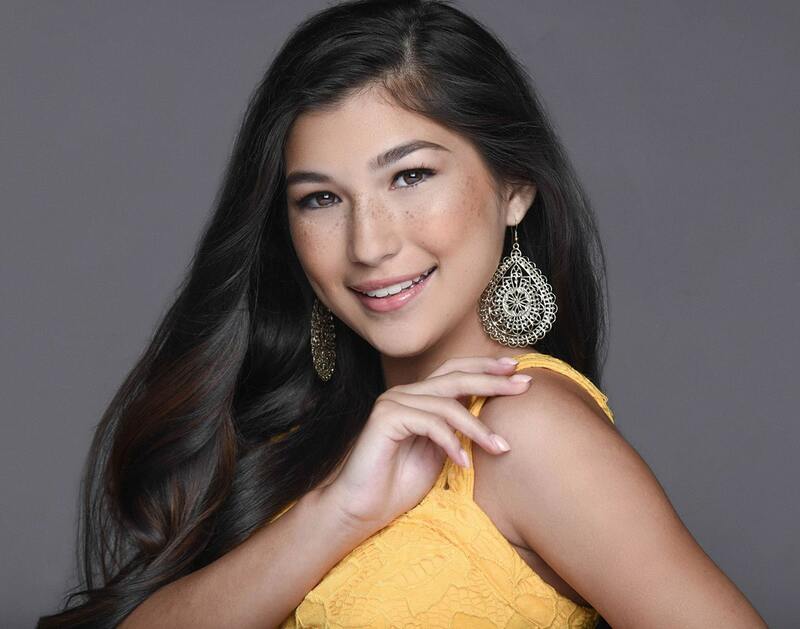 In October 2018, Anabella captured the prestigious title of Miss Sunshine Foundation Jr Teen and has been spreading sunshine and helping raise funds to benefit the Sunshine Foundation ever since. Thanksgiving weekend of 2018, she crowned her Pre-Teen Victory successor at the Miss American Coed national pageant and bid her final farewell as a preteen competitor. After the holidays where she travelled and shared time with family, Anabella captured the first ever Miss Florida American Spirit Jr Teen title and was awarded Best Portfolio and Best Casual Wear ages 4-15. She will be competing at the national pageant in June and looks forward to rocking the runway in her Marc Defang heels! Making it work and making a difference, she is Anabella Cecilia.